...Using The Same Exact System Thousands Of Musicians Are Using To Play Anything They Hear On The Radio In Just A Few Minutes!" Don't do it alone. Join over 203,750 musicians who have used the same exact methods on this page to literally transform their playing. (Keep reading for success spotlights of selected students). I personally think there's a huge problem out there for musicians who want to play piano (or any instrument, for that matter) by ear. ...And I'm guessing that you're reading this page because you, too, have faced the same problems that I'll talk about soon. There's just not much help for musicians who want to play outside of traditional "sight reading" or classical methods you've probably come across. I'm talking about help for "ear" musicians. Play piano without having to rely solely on sheet music or chord symbols (more on this later). Be able to hum a tune, then immediately play it on the piano in a few minutes. Be able to hear something on the radio or on a favorite album and immediately understand what's happening in the song without being at a piano. Sit down at the piano and play exactly what they feel... entertain guests and simply enjoy music. Play in a band with other musicians who play by ear and be able to follow along and improvise when the time is right. Play at church, accompany quartets or singing groups, and perform at special occasions without any fear or hesitation. Learn music at a comfortable pace without being forced to pay a teacher $30-$50 or more per hour. (Basically, all the things you can't go to most traditional teachers, institutions, and colleges to learn. And if you can, you'd better be ready to audition or pay hefty fees). ...And I realized this dilemma back in 1999 when I first started Hear and Play Music. A year later, I launched HearandPlay.com online and my journey began to help people learn music by ear. "I had no idea how many people were really struggling to play piano by ear"
Within months of starting Hearandplay.com, musicians from all around the world were e-mailing me request after request to teach them this song... and that song. This chord and that chord --- chord changes, progressions, hymns, music theory, ear-training, gospel music, jazz standards, blues, licks & tricks, ~~~~~~ (the list goes on and on). ...If any of this sounds familiar, the good news is that you're not alone. If you're like most of my students, you're struggling to pick out melodies, chords, chord progressions, and patterns in songs. Heck, if you're just getting started, you probably don't even know what chords and progressions are! If you've gone further and started to teach yourself, perhaps you're at a roadblock and really trying to put all this stuff together. How scales relate to chords... and chords to progressions... and how to find the keys songs are being played in, how to recognize patterns in songs, (just to give a few examples). Maybe you're reading self-help books and have bought every training manual or "how-to" video --- or have even taken personal music lessons --- but have been disappointed with the results. Learning piano is not an overnight thing. It requires commitment, drive, and discipline. Even pros practice daily and are constantly learning new things. Great musicians never think in terms of a "destination." It's always a "journey." There's always new things to learn. New genres. New techniques and styles. Unfamiliar theory and alternative ways to approach music. Other things to explore. And just simply improving upon what you already know. So with that said... if you think I'm just going to teach you some magical chords and you're going to play every song you've ever wanted to by tomorrow, then stop reading this page. I'd hate to waste your time. But if you're willing to put in some time and practice, I can guarantee that in very little time (compared to years and years of training, lessons, and school), you'll be playing the piano by ear and even picking up songs on the radio. I hear you saying under your breath. "Jermaine, what makes you so sure that you can teach me how to play piano by ear?" Simply put. Because my methods are proven and tested. Not fluff... not theories... not "would-be" or "could-be" methods but techniques that have helped literally hundreds of thousands of musicians by ear. As you may know by now, my name is Jermaine Griggs and I'm the founder of this site. I've been playing piano for majority of my life. I started at the tender age of 7 years old playing for my church's junior youth choir. Some of the things I now teach came naturally to me back then (although I had no idea how to articulate them) and many of the things I've learned over the span of 17 years by literally reading, watching, and studying everything I could get my hands on. The rest has come simply from "school-of-hard-knocks" experience out there in the real-world. Personally, that was my best teacher. I'm a graduate of the University of California at Irvine and have had the privilege to work with top professors and colleagues. I've helped lead the gospel choir there as well as many other campuses. My main accomplishments as a teacher have come from this site, HearandPlay.com. Over 41,185 people from over 102 Countries have already relied on me to teach them how to play the piano through my various paid courses. Many of them have since gone on to play in bands, for churches, special events and more (as shown in their Testimonials). I currently serve more than 203,750 online members and supply over 1,500,000 visitors (that's ONE AND HALF MILLION PEOPLE) per year with my online piano lessons, newsletters, and more! Click here to see a screen shot of my website statistics. Thousands of students now teach beginning piano to students! Imagine going from learning piano in a few months to passing on your knowledge to children in your community, church ... or even family members! ... and by the way, Hear and Play Music is also a member of the Better Business Bureau. Feel free to click on the logo to get our "A+" rating. Since my first day online in August 2000, HearandPlay.com has evolved into a multi-staff music instruction company and our headquarters are in Irvine, CA. I have been playing for 40 years and have not had many lessons. These online keyboard courses are the most organized method to getting a well rounded keyboard education. There is no substitute for this course. In a matter of minutes I saw and heard many aspects of playing that I never could get my wits around...thank you for this opportunity. Jermaine, It is always an honor and a pleasure to share blessings! Hear and Play is one of the best things that have happened to me and my fiancé Albert Williams! We just THANK GOD for giving us an opportunity to learn from and be a part of such a wonderful and vibrant productive family! We have seen the glory of God through all of the lessons and resources! As Albert is at work now, I speak on his behalf to say he has lessons printed to look at during his breaks and every possible chance he has. It has been his persistence and growth that has inspired me so. All of your teachings and lessons have been such a wonderful joy to the both of us. We talk about the fact all the time that to be able to have the opportunity to learn things that we each have always wanted and for various reasons unable to do so until now is another miracle from God! Albert, has learned ahead of me many of the lessons and it is such a joy now to have him teach me a lot. He has printed materials all around and portable players to listen to the mp3 lessons while on the go. I am still trying to learn my basics but I am smiling as I write this testimony knowing I will eventually get there. This is the power of practice and having such a great inspiration! I thank you! We thank you! We thank God! This site is going to be extremely helpful to you. And to make sure you get the most applicable advice, you'll find three major categories most of my visitors fall into. Please click the link below that best describes your situation. What you click will determine the information you receive in the advice box below. I have very little or no knowledge about playing by ear. but I don't consider myself a pro. I still have lots of learning to do. I'm a professional musician. I'm here to learn even more in the area of playing by ear. Information will appear below after clicking an option. "Learning piano doesn't have to be hard. Learn the shortcuts and tricks to playing piano quickly and easily." Here's an example of a few shortcuts that'll save you lots of time. You may or may not already know them. Of course, you'll want to read the rest of this page to find out how to get all the secrets... but for now, pay close attention to what I'm sharing here. In my "advice box" above, you've already learned why scales are important. You've also learned how to get started identifying and recognizing patterns in songs. Now I want to show you an easy technique on how to play any melody or chord progression in all 12 keys! Ok ... let's say you know how to play a C Major Chord (C + E + G). But what happens when someone asks you to play an F Major Chord or totally switches a song to another key? ...What do you do then? There's thousands of chords, voicings, and inversions out there and you definitely can't memorize every single one of them... but you can understand techniques and principles that will allow you to play any chord right off the top of your head (without practicing or memorizing it). Above, you will find the notes of the C major scale (Diagram A). Using a simple technique I will show you in my course, you can pick three notes from that scale to create a C major chord (Diagram B). "Wait ... you mean to tell me that it's that simple?" Knowing this, all you would have to do is apply the same principle to all 12 major scales and you'll get all 12 major chords. Don't worry... I'll show you, step-by-step, how to form all 12 major and all 12 minor scales (and the chords that come from them). This same procedure, as you will soon discover, can be used to learn virtually any chord: minor seventh chords, dominant chords, diminished chords, augmented chords, ninth chords, eleventh chords, and more. Here's a "cheat chart" to help you remember some of the easy chord formulas. Keep in mind that the numbers below come straight from the scale (e.g. - "the first tone of the scale equals 1... the second tone of the scale equals 2... the third tone of the scale equals 3, and so forth). Now that you understand the "number" system, just use my "cheat chart" to play any chord you want. Major Triad 1+3+5 of major scale! You should definitely print these "easy formulas" out. You'll use them a lot in the beginning. This is just one time-saving strategy that you can use to start playing piano by ear in no time. With private lessons, you probably wouldn't get passed "seventh" or "ninth" chords after a year or so and $$$ thousands of dollars in fees. That is, if you can find a teacher who specializes in the style of music you want to play by ear. That's the tough part. Even at $30 an hour (which is cheap), weekly lessons would cost you $1,560 per year. After the second year, you would have paid over $3,000.00 bucks! Most people take years of lessons and only a handful of them continue on to their desired levels. Others teach themselves at their own paces and thousands of dollars cheaper. Below, you'll find stories of people who have taught themselves how to play. Some went the private teacher route first... then decided that it wasn't for them and eventually sought out our site as a way to help them accelerate their learning. Others came to us from the beginning. Read their stories and see what you can learn from their experiences. At the least, these success reviews will be an inspiration to you, no doubt! "You'll definitely find someone who was in your situation in one of these 15 published success reviews..."
(I've included the personal links of members who have profiles in our community). ...but after one night of taking our lessons, his playing was revolutionized!" I thought I had a decent grasp on music theory after having played guitar for 13 years. I tried my best to apply this knowledge to the piano when I decided to learn to play. I had very limited results. But after one night (literally) of taking your lessons, my understanding of chord structures and my playing ability was revolutionized. Thanks Hearandplay! ...I will send many folks your way"
I purchased your courses and I was very impressed by the professional quality of your product. I plan on ordering even more of your products in the future. This is in great contrast to other products I've ordered online. I ordered instructional materials from [various sites], and I was not impressed. Yours is truly a "good deal" for the money, and I will send many folks your way! I'm playing better already! "Jermaine has cleaned the window to my mind of understanding"
Jermaine has cleaned the window to my mind of understanding. I now pick out chord progressions in songs just by hearing them. After years someone has given ear trained musicians the resource they need to truly play by ear. Thanks Hear and Play! "World-Renown Drummer & Television Host Enhances His Piano Playing..."
My name is Charles Shelton Jr., and I've been playing keys for about 10 years now. This site has really helped me out a lot by various lessons and being able to learn the newest songs out on the market. Especially with the virtual chord finder that is a major help if you can't read music. Especially, being a world renowned drummer it helps so I can help write keyboard parts. A lot of you all have probably seen me on the Word Network. I've been on shows like the Charles Shelton Jr. show on the Word Network, Dr. Bobby Jones Show, Pax Network, Sky Angel, as well as touring and doing clinics in many different cities. I also have an instructional Gospel Drumming Dvd that I have for sale for all ages. Jermaine Griggs is a blessing. Being a promoter and endorser of different products, I don't advertise or endorse just anything. Jermaine, you are a blessing... keep up the good work. If you've already decided to order my 300-pg home study course, "The Secrets to Playing Piano by Ear," click here now, and claim an additional bonus CD (worth over $200) just for ordering today. I personally guarantee that you will be playing piano by ear in no time. I'm so convinced that this course will be the answer to your dreams that I will offer you a Life-time Money-Back Guarantee! I will even allow you to keep the free bonus (software CD-rom) as my way of saying "Thanks." "I only knew some chords to play..."
"...But now my piano playing has improved greatly!" I'm Evelyn. I've been playing piano for 9 months. Since I've discovered this site, I only knew some chords to play but now my piano playing has improved greatly! Not only that, I've also learned some gospel songs, accessed many piano lessons online, and downloaded videos. And most of all there are so many friends who encourage and feed me the word of God. You get everything you need from this site! Thank You Jermaine! "I was skeptical about this course at first, but..."
"After doing the lessons, I must say that I was very impressed!" My name is Ed and I am a trumpet player and instructor in Florida. Honestly, I was skeptical about this course at first. I went through the entire site and read everything I could about this system. I decided to sign up for the lessons to finally prove or disprove my reservations about this course. After doing the lessons I must say that I was very impressed! I definitely learned a lot and some different ways to think about music that made a lot of things so simple. It is even evident in my trumpet playing. I have had the opportunity in my life to talk to and perform with some of the great musicians of our time and in talking to other trumpet players (Gillespie, Marsalis, Sandoval, Ferguson, Faddis and so on...) they all suggested that I learn how to play the piano to really get inside the music. The people who heard me before and after I started this course have noticed a difference in my trumpet performance! As I get deeper and deeper into this course my ears are really starting to open up and "hear" many different sounds and tones in which I never paid any attention to before! I just want to say "THANKS" for such a great course. I also want to give my personal endorsement for this course and suggest that all musicians (especially the wind players) get this course so you and others can "Hear" a difference when you "Play!" "BOY... it is INFORMATIVE and RESOURCEFUL!" "Now, I'm complimented over and over about my new found 'style' and professional 'touch' of music"
I've been a musician for more than 9 years, and I had reached a point where I felt as if I was playing the same thing over and over as if I had hit a musical wall (...you get the point). At this point, I began searching for help online, and that's when I found this website; BOY - is it INFORMATIVE and RESOURCEFUL! Since coming here, I've been complimented over and over about my new found "style" and "professional touch" of music. That's how much I've gained from this website, from the video lessons to the online posts with REAL musicians who LOVE music just as much as I do. This was my place of turning my CENTRIPETAL force of music taken to the next level. "I love Hear and Play!" "Now, I'm also indulging in a life long desire to play the piano"! I love Hear and Play!! I'm a grandmother of 8 girls, and a novelist. I'm also lately indulging in a life long desire to play piano by ear, and the help I'm getting from all the wonderfully talented people on the forum is invaluable. Thank you so much. "I have ONLY been playing for 6 months and..."
"Hear & Play has taken my piano skills to another level"
Hello! My name is Dante Smith, and one day I was looking online for something to help me learn the Piano. Well, I found it!! Hear & Play has taken my piano skills to another level. I have only been playing for 6 months. I never had any training at all, but by just following along with all the lessons, I have awoken something in me that I thought I didn't have. To keep it short & sweet, I would recommend this website to anyone who truly wants to learn basic music theory. Last but not least, it's all up to you. If you want to learn to play the piano, this is the perfect tool and while you're at it join the community that Mr. Griggs has created and surprise your family with this great gift of Music that you thought you didn't have. "HearandPlay has been a tremendous blessing to me"
HearandPlay has been a tremendous blessing to me. I have been playing for some time now and filling in the gaps as far as musical knowledge has been much easier. I am a fan of knowing music theory, and it is refreshing to communicate with others who feel the same way. "I ordered the Techniques & Fundamentals..."
"...Which has helped me more than I can say"
My name is Ernestine Smith. I've played piano for years. I heard other people playing more beautiful and full chords and I wanted to do that. So I surfed the web and found Jermaine. He doesn't mind sharing his knowledge and that's what drew me to him. His online lessons were just what I was looking for. I also ordered the 300pg course, "Techniques & Fundamentals," which has helped me more than I can express. Thank you Jermaine for making it plain and simple for us! "I have enhanced my live playing at church tremendously"
Hi, my name is Marcus and I just wanted to let you know that I bought the book written by Jermaine Griggs called "The Secrets to Playing Piano By Ear." With this course and the generous email follow-up lessons from J. Griggs, I have enhanced my live playing at church tremendously. The books, emails, and online lessons have taught me a lot of musical terminology that's just awesome. I can't wait to get more new releases. God Bless you! "I'm gradually unlearning most of my bad techniques of my younger days ..."
"...This website is helping me rebuild my confidence and wish I would've discovered it a lot earlier!" I started at a young age and then quit piano. Then again as a teenager, I went to a very well known, orthodox, and conservative piano teacher trying to acquire appropriate skills and techniques to fulfill my dream of being a professional concert pianist. I failed miserably and later ended up with a Marketing career instead! Many more years afterwards I returned to piano, taking it up as one of my more intense and passionate hobbies, somewhat trying to do and accomplish what I failed doing years ago. Thanks to Jermaine Griggs and the HearandPlay family, now as a middle-aged piano player, I'm gradually unlearning most of my bad techniques and habits of my younger days. The website is helping me rebuild my confidence and wish I had discovered some of these teachings long time ago....Where were you Jermaine? I am so delighted that I found the HearandPlay Zone and in turn , Jermaine Griggs' 300 pg course - "The Secrets To Playing By Ear" package. Jermaine, thanks for making the piano learning methodology so user-friendly , well-structured, easy-to-remember and enjoyable. I truly appreciate your efforts for describing the piano technique and practice habits on a down-to-earth level that makes sense! This "hands on" nature of the program along with its "interactive" approach focuses on the fun and sheer pleasure of playing music. The results dispel the notion that learning to play means enduring years of lessons, repetitions, relentless hours of drills and boring practice sessions. This zone along with its "online lessons" platform is a powerful tool for anyone, especially newbies interested in learning and growing. You rock Hearandplay! Click here to read what other satisfied customers have to say about our site and courses. Don't worry if you don't understand some of the audio titles above (i.e. - "2-5-1" and "I--IV"). Those are all covered in the course. By the end, you'll be "talking" and "walking" this language. 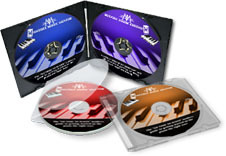 Note: There are over 330 sound examples to accompany the course on a Bonus CD. However, this bonus item will not be offered for free much longer. In the future, you will have to purchase the programs on the Bonus CD separately. Click here to claim your additional bonus CD (worth over $200) before it's too late. Save money. Save time. Start now! Unlike today's "eBooks," this home study course consists of a comprehensive 300-pg information-loaded workbook packed with tons of useful diagrams, charts, notations, techniques, secrets, principles, articles, and more. These techniques have been tested and proven to work with literally anyone regardless of age and musical experience. *This is a physical course that you'll receive in the mail. Over 300 pgs of revolutionary techniques, principles & secrets. Over 20 chapters including two bonus chapters on Sight Reading. Diagrams and Sound Examples are coded with "SLXYZ" symbols which can be accessed on the bonus CD (more info below). Skip all the mistakes. Take your playing to the next level today! Scroll up after clicking to read. I want to show you a whole new world. A world that combines music theory, ear-training, and practical applications --- techniques that will benefit you from here on out! Have you always wanted to learn piano? ... or perhaps improve your piano playing? You've finally found the answer. This is my complete system: It is a 300-page information-loaded workbook packed with tons of useful diagrams, charts, notations, techniques, secrets, principles, articles, and more. ... But I am so convinced that this course will answer your prayers that I will allow you to keep it as long as you want. FULL-WORKING VERSION OF PIANO PLAYER PLUS v1.0! Over 500 Questions. Once you're done with this program, you'll know virtually every term in a musician's vocabulary. Over 150 Interactive & Sound Exercises. With the click of a mouse, you can select several random scales, chords, progressions, and intervals and answer questions based on what you hear. These exercises are aimed at training your ear quickly and efficiently. Over 20 Chapter Review Tests. At the end of every chapter, Piano Player Plus v1.0 will allow you to take a review test. The best part is that when you pass each test, it will issue you a one-digit code for every chapter. Once you have accumulated all 20 codes, you can then submit the code to HearandPlay.com for a free gift! Online Help. If you are connected to the Internet, with the click of a button, you'll be able to connect to the member's section of our site and ask as many questions as you want. The 300-page home study course features over 330 chords, progressions, and sound examples and with a click of a button, the Sound Library v1.0 will allow you to access every single one of those sound clip examples. Not only will you get the opportunity to study these chord progression on paper but you will also be able to hear and even play along with them! Bonus Songs. There are also a few bonus songs on the CD for your own enjoyment! Also, for a limited time, we're including another piece of software on the bonus CD-rom. Since this doesn't normally come with the package, it may not be offered as a special bonus for long. Step by Step Instructions. Since many of you have questioned whether you'll learn these sound examples exactly how they are played, I have decided to include step-by-step instructions on how to play each and every one of them! Chord Diagrams. Along with step-by-step instructions are illustrations of every single chord --- so not only will you see that a chord progression includes a Cmin9 (b5) or an Fmaj7 (b5) chord, but you'll know exactly how I played it (the same exact inversion and voicing). If you order before midnight, I'll include two more bonuses worth the entire cost of the course by themselves (...other customers have paid full price for these at our other sites). The full version of P.I.T.C.H. (Pitch Identification Training for Competent Hearing) sells for nearly $70 bucks and now we're throwing it in for those who order today. (Note: We used to offer only a 7-day trial version but have since upgraded this bonus to the FULL $69 version of the software). P.I.T.C.H. allows you to interactively train your ear in several ways. You can connect your midi keyboard, your microphone, or use the program with your regular computer keyboard. It is one of very few programs that verifies that you're singing the right notes and distances. There are over 800 exercises and an unlimited amount of session questions. After all, if you can't hear and sing it, you can't play it. This is worth the entire cost of the package by itself. This Bonus available online only. Back in 2005, I held 7 group training sessions over the phone. They were recorded and the audio files and outlines were placed online for the group members only. Each session was $19.95 each. Because you're ordering today, I'm throwing in instant and unlimited access to this members-only area. That's over 13 additional hours of education online for free! Now picture this: It's a year from today ... let's say next (or a lot sooner), and you've drastically improved your piano playing --- with a lot less effort than you expected. Even better, you are actually playing in a band, directing a choir, or serving as a musician at your church. Perhaps, you're not doing any of these but you now enjoy playing the piano in your free time... especially with family and friends gathered around. Now, stop and look back on today. Considering that you've now learned how to play the piano from scratch, or have greatly improved your piano playing, what price tag would've made it a good investment? To determine this, I surveyed previous customers of other products and have analyzed the potential power of this course, and have arrived at the affordable price of $237.00 (which is just a fraction of the value of the bonus items alone). Instant Savings Coupon: You've arrived at this page just in time to take advantage of a special test offer we're running for the next few days. For just 2 easy monthly payments of $41, this entire 300-pg Home Study Course plus all of the bonuses (3 software programs on CD-rom, P.I.T.C.H. Ear-Training instant download, V.I.P. access to my 13-hour members-only audio classes, and 3 free cd courses) can be yours. This offer is subject to change at any time so if you're really interested in this comprehensive package, I suggest you act quickly --- otherwise, you might end up paying $237.00 or more in the future with no bonuses. If not, my 100% "NO-RISK" guarantee should help you make a decision or you're just not serious about this. That's over $155.00 off the normal price --- just for ordering between today and . Think about it? If you paid a piano teacher an average of $30 per lesson every week, in one year, you would have paid the teacher over $1,500. Why am I giving away my complete package (normally priced at $237.00) for a special price of only 2 monthly payments of $41 when I can sell it for well over $200.00? One reason is that I want to give everyone the opportunity to learn piano without having to pay a piano teacher thousands of dollars or even pay for a course well over $300. I've done my part ---- it's now your call. If you use any of my written products, I personally guarantee that you will benefit from them - PERIOD. Otherwise (1) you can return the course and the $400.95 in bonuses are yours to keep and (2) I will refund you 100% of your purchase price (excluding shipping costs). If you don't agree that this information is literally worth every cent, or if you change your mind about the course for any reason at all ... it can be because you felt it was not worth the money, or just because you didn't like the paper it's printed on ... you can return it at anytime for a 100% refund of your money. Our shopping cart is hosted on a SECURE SERVER that has maximum 128-bit super-encrypted Secure Socket Layer (SSL) technology that absolutely prevents others from accessing your information. Visa®, MasterCard®, American Express®, and Discover® Cards also officially back us to GUARANTEE your online security -- you will never be held liable for any unauthorized access to your card. I've been offering this same guarantee for years, and only a handful of customers have failed to learn how to play piano with these techniques. Sure, once in a while there's a tire kicker who buys my course, does nothing with it, and sends it back for a refund. But as you can see from my testimonials, customers who USE my step-by-step methods are wowed by the results, and would never think of trading my course back for a few dollars. If you've read the testimonials from my customers, you've already seen what my product can do for you. I teach the simplest, most easy-to-understand techniques, secrets, and principles to learning the piano by ear. Claim Your Copy of "The Secrets to Playing Piano By Ear"
Are you tired of playing the same chords? Wishing that you played the piano? Playing the same sheet music over and over? Watching others play beautiful songs by ear? Wasting your time playing basic stuff? 3) Click here to print out an order form to mail or fax your order. Make sure to print out the order form before . The course is shipped via USPS Priority Mail. You will receive the course in about 5 business days and can get started learning my techniques and principles the same day you receive it. You can literally be on your way to playing tons of new chord progressions by next week. Still not sure...? Click the sound icon on the left to hear a few more reasons why you should get this course. P.S. - At this point after reading a typical offer, you probably think to yourself "Do I really want to gamble $237.00 (Special: 2 monthly payments of $41)?" Just remember --- that's exactly why I've offered my "Nothing To Lose" Guarantee for years. If my course doesn't deliver, I'm the one who pays — not you. The $400.95 worth of bonuses are yours to keep no matter what. That's a guaranteed gain, no matter what you decide. Click here to order online now. P.P.S. - Remember, this offer is only valid until . Click here to reserve your copy of the course before this special ends. Complete the form below and click "NEXT PAGE" to start your order. Your receipt and any downloadable bonuses will be sent to this e-mail.